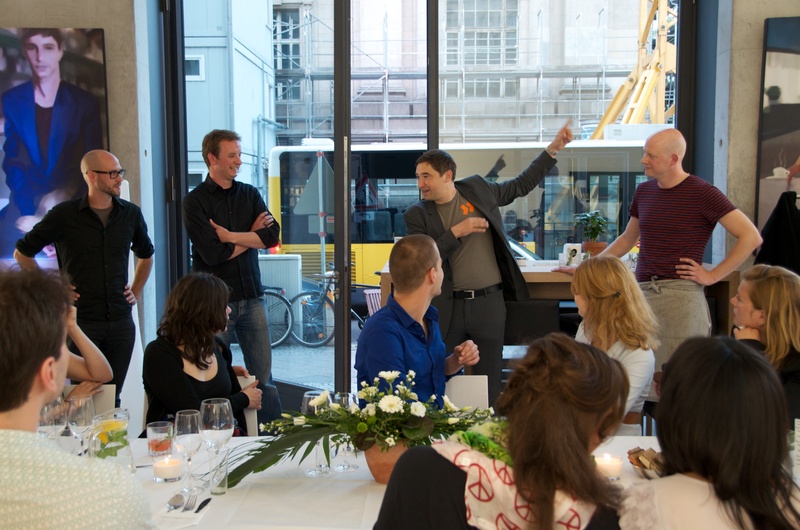 Last Saturday Paul, Paul and I opened our second pop-up Restaurant. Like the first time in BetaHaus, Kreuzberg we invited 20 guests that all brought a friend with another nationality than themselves. 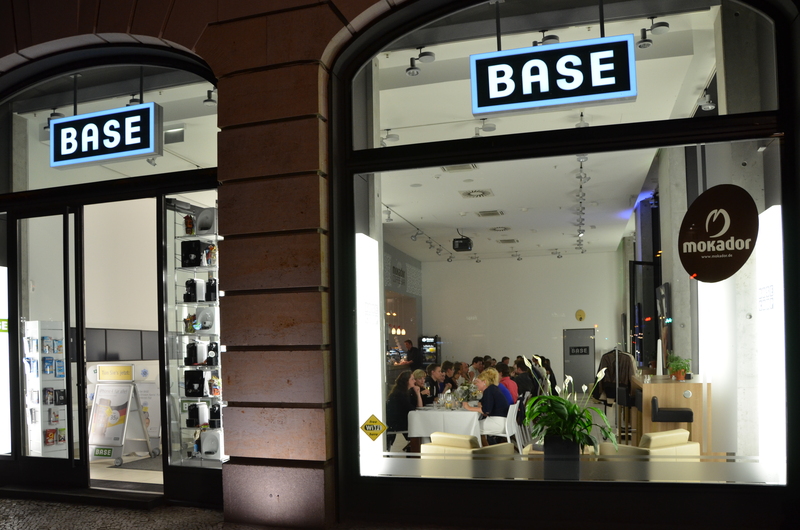 We switched the location from a rough cool former industry plant to a showroom in the fancy Unter den Linden. Base_camp made it possible and the Team from Mokador set a fabulous table that impressed all tourists passing by the windows in the sunny afternoon. We welcomed our guests with a strawberry cocktail. 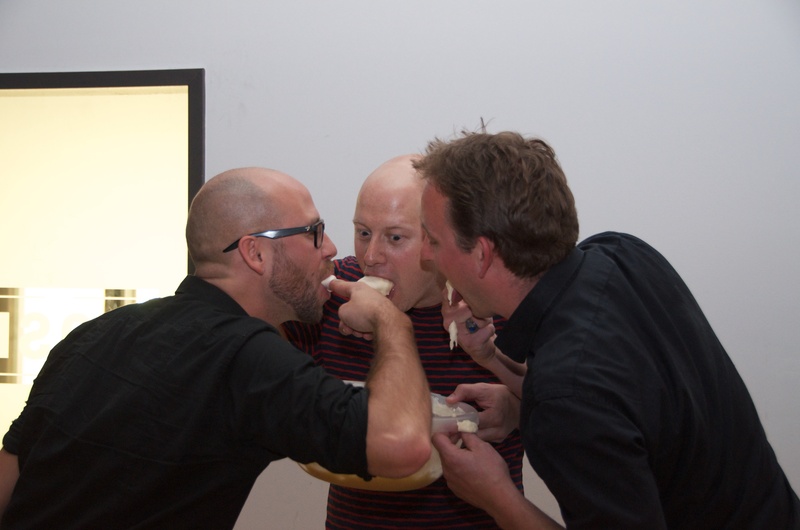 Apparently, that helped to secure a perfect atmosphere even before the amuse was served. Like the first time, it turned out to be a great noisy evening with a lot of laughs and many new acquaintances. 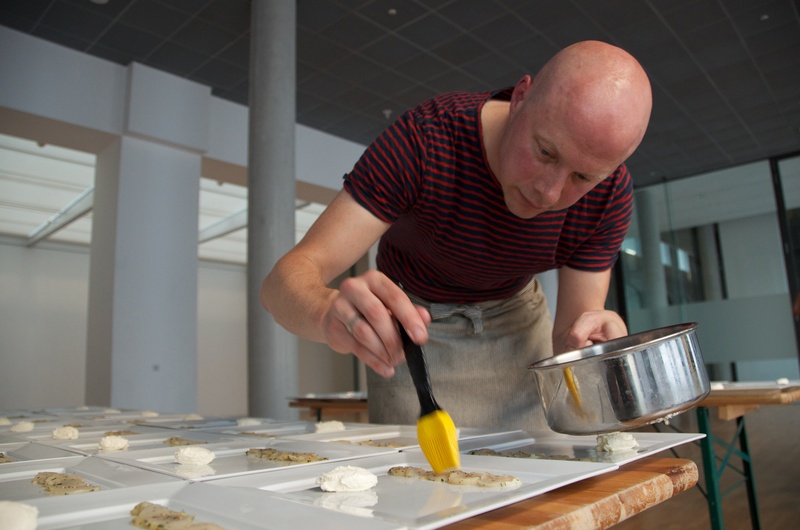 We had a challenge preparing the dinner – the Base_camp does not provide a kitchen. The solution: a cold menu that we could prepare at home. Isn’t a cold dinner kind of boring? Well, have a look at the pictures below. Last preparation at the location. Start with the scallops. Fry them very short in butter on each side. Let them cold and then mix them with dill and chives. Flavor with salt and pepper. Put the whole marinated scallops in the freezer for 2 hours. They should get firm so that you can slice them into very thin slices. Champagne glaze: Half the onion and get it to boil with the champagne and the tarragon. Let it simmer for 5 minutes and then remove the onion and herbs. Put the gelatin in cold water for 5 min and then whisk it with the fluid. Put cold until serving. Truffle crème: Mix Philadelphia cheese, parmesan, lemon zest, salt and pepper to a crème. Add truffle oil carefully. The crème should get a taste of truffle but, you should also be able to pick out the other ingredients. We used a teaspoonful. 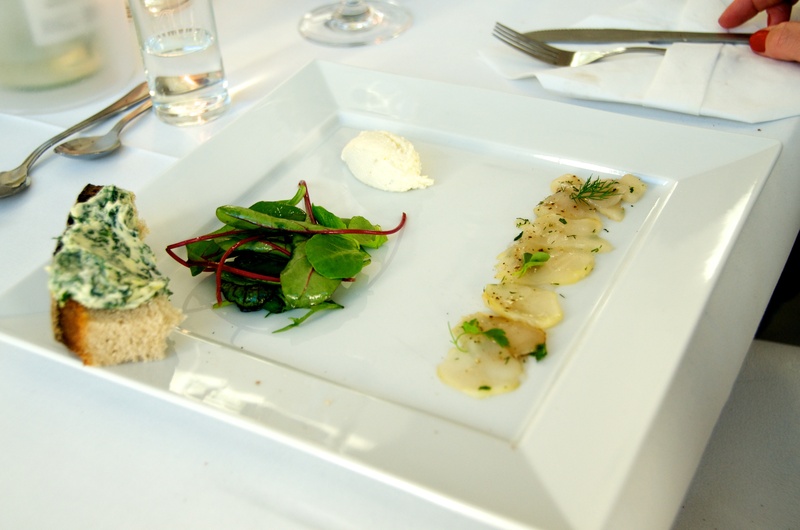 Serving: Cut the scallops in very thin slices and arrange on a plate. ‘Paint’ the scallops with the glaze. Flavor the spring salad with lemon juice and olive oil. Arrange the creme and a spring salad on the side. Start with the cocktail tomatoes. Half each tomato and put it on a oven plate. Sprinkle olive oil and chopped garlic on top. Put in the oven on 80° for 4 hours. Veal: Fry the meat very short on each side. Put the whole fillet in the oven on 120 ° C until the meat temperature reaches 56 °. Remove and let it rest for at least 30 min. Tuna sauce: Mix the canned tuna, mayonnaise, crème fraiche, lemon juice and the garlic clove in a blender. Flavor with salt and pepper and put cold until serving. Herb oil: Mix the olive oil (1 dl) with rocket salad and basil. Strain so that just the nice colored and flavored oil remains. Tuna: Cut the tuna in rectangles with the height 3 cm and the depth 3 cm. The lengths depend on the tuna piece you got. Fry the rectangles on four sides very short. Should get nice fried surface but be raw inside. Put the rectangles directly in the fridge. Before serving, cut the rectangle on the length so that you get nice cubes 3*3*2 cm. See the picture. Asparagus. Boil or steam the asparagus al dente (ca 3 min). Put them in ice cold water to avoid them getting soggy. Just serve the top of the asparagus. Boil the quail eggs for 2-3 min. Peel and half. Arrange the cold ingredients as in the picture. Start with the mousse: Whisk yolks and sugar to a foam. Melt the chocolate carefully. Whip the cream to a light foam. Add the chocolate (not too warm) into the egg toddy and stir. Add the chocolate cream to the whipped cream and stir. Put cold for at least 3 hours. Rhubarb: Heat the oven to 150 ° C. Cook the water and the sugar to syrup. If you have thick rhubarbs, peel, otherwise place 500 g rhubarbs on an oven plate and cover with the warm syrup. Bake for 10 min. The rhubarbs should be firm but hold together. Remove from the syrup and keep cold. Taste the syrup. If too sweet add water, if not enough taste from the rhubarb, add the rest (200g) and boil for 5 min. Let the rhubarb+syrup get cold before straining the syrup so that only the fluid remains. Keep cold until serving. 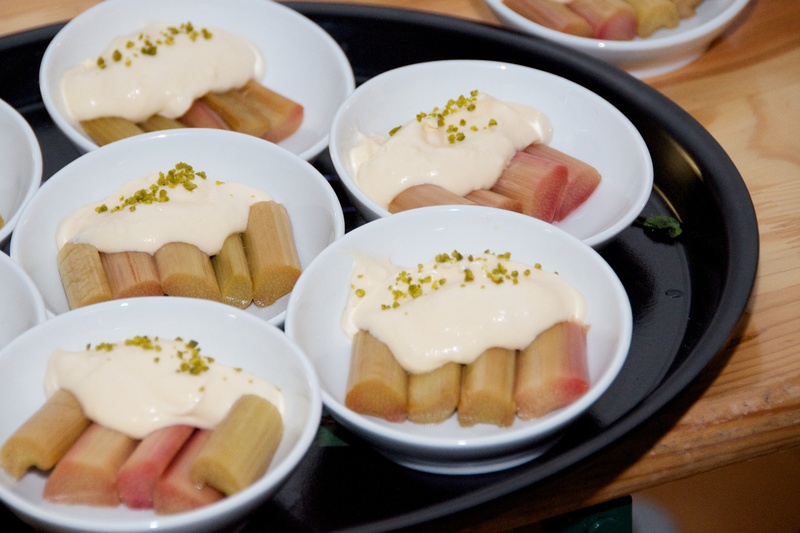 Servings: Cut the rhubarb in 4 cm long pieces. Arrange on a soup plate. Add the mouse on top or on the side. Top with pistachios. Pour the soup into the plate on the table for a nice special effect. Even though some guests had three portions of the chocolate mousse, there was some left for the chefs. A great thanks to Sachar and Robin for hosting us with such ease and to Tobias from Mokador who made the co operation so uncomplicated and professional. If you like to take part the next time the RollinRestaurant open its doors, this is the place to keep updated. You could also follow me on twitter or send us a Email and we will let you know when the next event takes place. The BetaDinner turns into RollinRestaurant. SOLD OUT! Update – we are sold out. If you want to be on the waiting list or if you like to get an Email alert for upcoming events, just send us a mail. 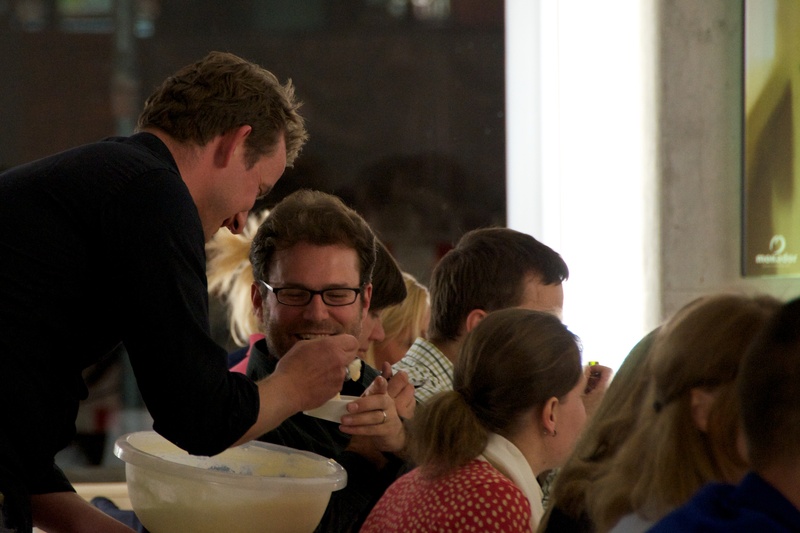 Thanks to 40 fantastic guests our BetaDinner on the 5th of March was a success. 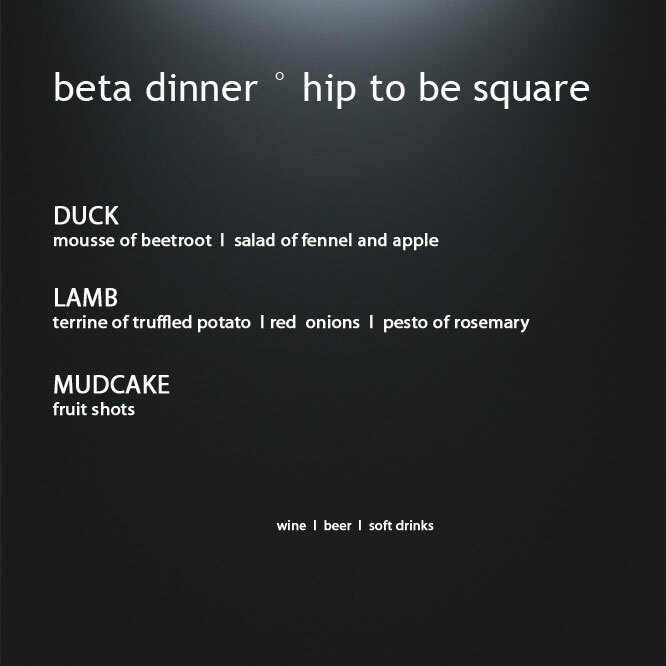 Strengthened by the feedback, we are excited to host a new dinner. 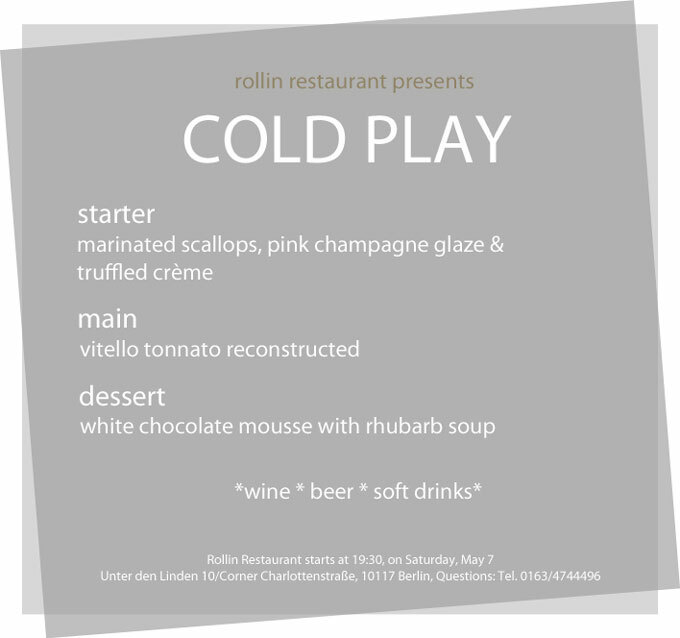 The dinner will take place in downtown Berlin on Saturday the 7th of May. We like to have you as our guest but you need to fulfill two conditions; to begin with, you look forward to spend an evening with great people and excellent food and second, you will bring a friend. Not just any friend, but a friend with another nationality than yourself. For example if you’re German you bring an Italian friend, if you’re Norwegian you bring a Brazilian friend and so on. What can you expect from the evening? Well, we can assure you we aim high with our three course dinner. 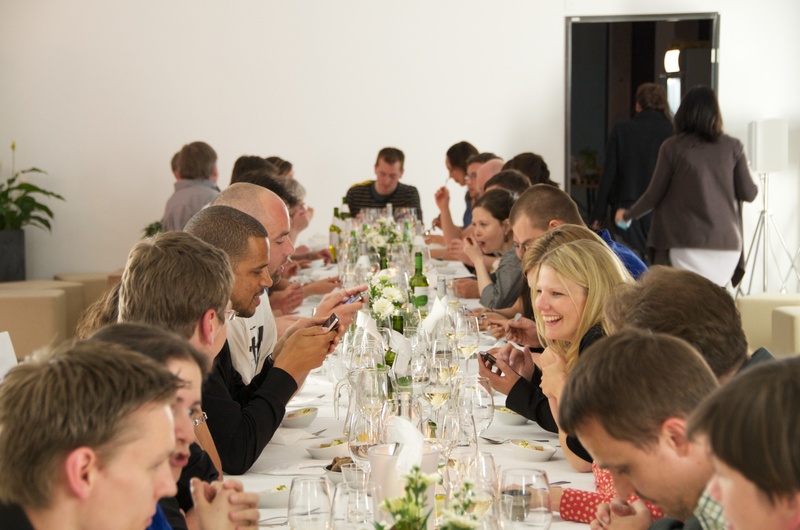 Apart from the food, we are sure the mix of 40 food lovers with different background sitting at one large table will guarantee a fabulous evening. 1. Send an email to rollinrestaurant@googlemail.com. The first 20 with friends are in. 2. Wait for the confirmation email & transfer 30 Euro per person. 3. 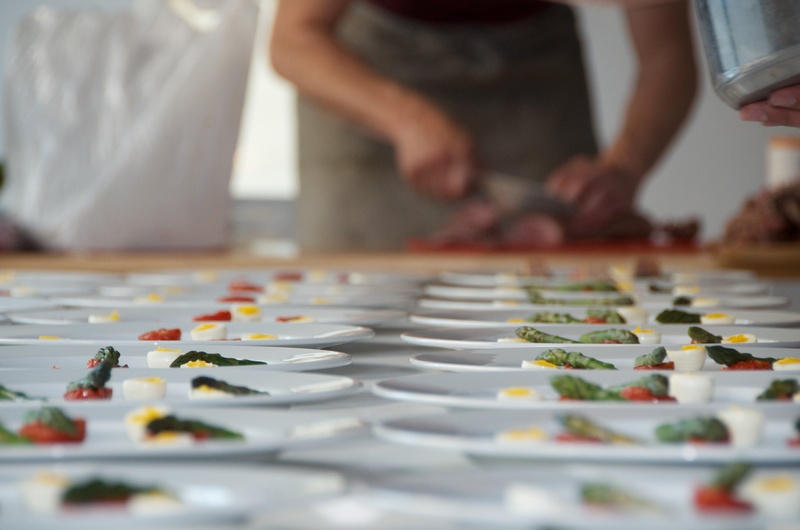 On Friday the 6th of May you will get an email with the three course menu and the address to the dinner location. Drinks are not included in the price but at the location you can buy beer, wine and non-alcoholic drinks at reasonable prices. By the way, the dinner is for you who love food and eat everything. We’re not serving vegetarian food or other alternatives. We are looking forward to serve you and your friends! You will also find this invitation in German on Paul’s blog. P.S. If you would like to come, but your friends from abroad can’t make it, just post that in a comment and check out the comments on Paul’s Blog– maybe someone is there without a partner as well, and you guys can go together! Last Saturday Paul, Paul and I hosted the first BetaDinner. The evening exceeded our highest expectations. We were pleased with what we prepared and according to the smiling faces among our 40 guests we were not the only ones satisfied with the food. 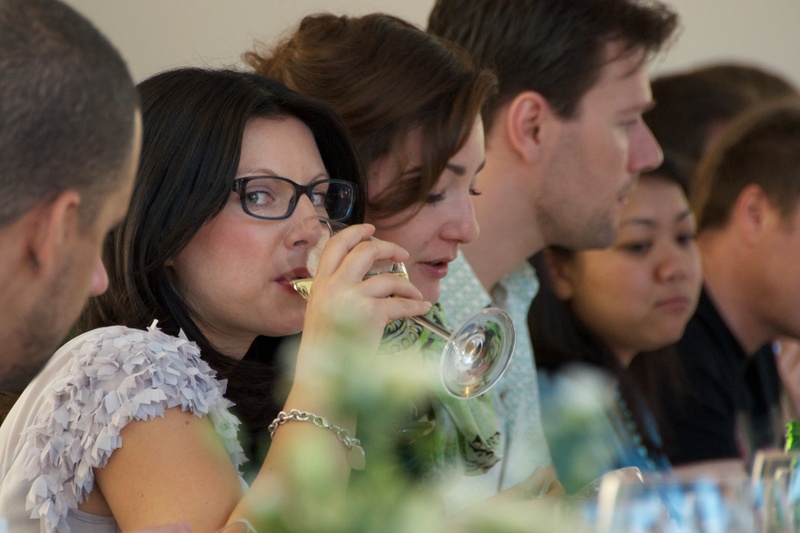 Most of the guests didn´t know each other upon arriving but it took less than then minutes before the noises of the kitchen blenders were heard about the conversations around the two huge tables. We were very glad to see so many nationalities; Swedes, Americans, Italians, Romanians, Russians, Austrians, French, Greeks, Slovakians and Danes. Almost forgot it, some Germans were there as well. We’d love to share a bunch of wonderful pictures with you, but Sebastian, the photographer, got his backpack including his camera stolen after the BetaDinner. We don’t have a single picture of the night. 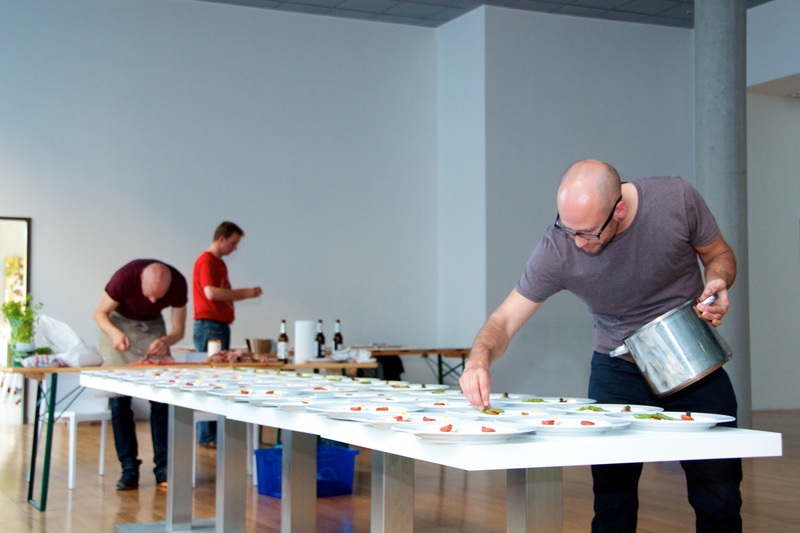 The only one, which we took ourselves during the preparation, is the one you see on top – the first course. Not only are we now missing all the beautiful pictures, but also a very talented photographer needs every job he can get. Look at what this guy is able to do with his camera and have him in mind, the next time you need a photographer. He does an amazing job! Below you find all our recipes from the evening. If not stated, all recipes are for 4 persons. And, one more thing! We had such a blast that we most certainly will do this again. Where and when is not yet stated but we’re working on it. As soon as we’ll know you will find the information in our blogs. Starter – mousse of beetroot and goat cheese, smoked duck breast, fennel and apple salad. Start with the mousse. The dish has one critical moment. You need to get the right amount of gelatine compared with fluid. For each decilitre fluid you should use one gelatine leaf. Boil the beetroots, wine, bay leaf, vinegar, sugar, peppercorns and salt until the beetroots are soft. Prepare the gelatine by putting them in cold water for 5 min. 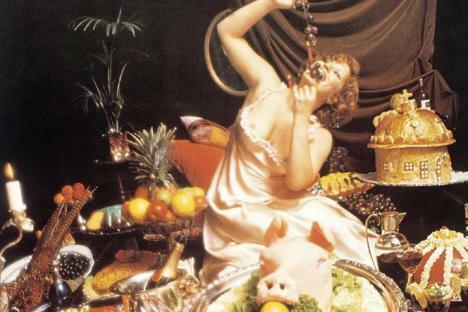 Mix the beetroots and the wine until the consistency is like the yoghurt. Add the gelatine and mix the warm fluid another 30 sec. Add the goat cheese and the yoghurt. Mix and then pour into a form covered with plastic wrap. Put in the fridge until it settles (at least 3 h). Remove the fat from the duck. Slice the breast into 2 mm thin slices. Heat the fat and mix with the breast. Remove the breast until 30 sec. Put aside until serving. Remove the dill from the fennel but keep it because you need it as garnish. Slice the fennel and apple wafer-thin. Mix fennel, apple with a tbsp olive oil and a bit more orange juice, salt and pepper. If you have loads of time you can pinch small pieces of the orange and garnish the mousse with. Serve the mousse with the duck breast and the salad apart. Garnish the salad with the fennel dill and chopped walnuts. 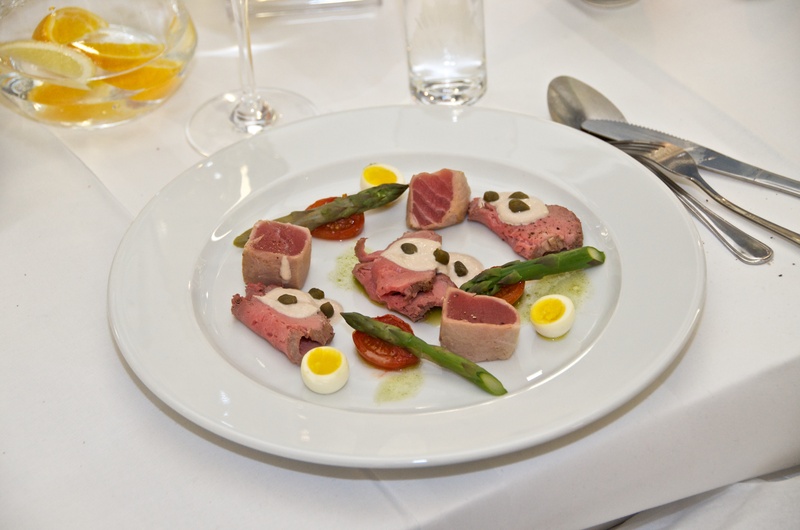 Main course – saddle of lamb, potato terrine with truffle, sauce and rosemary pesto. Start with the terrine. It should be done a day in advance for the best result. Peel the potatoes and shred it very fine. Squeeze out most of the liquid. Mix all ingredients to the terrine and add pepper and lots of salt (potato needs a lot). Wrap an oven proof terrine dish with plastic wrap and fill with the potato mix. Bake in 120⁰ C oven for 2 h. It should not get any colour. Put press on the terrine so that it will be easy to cut into slices. Before serving, cut it into pieces and warm in oven. You get the best sauce if you cook or buy a really good broth. Once the broth is done, this sauce will almost prepare it selves. Cut the onion and garlic in slices and fry it together with the larding bacon (smoked). Add the wines, broths, bay leaves and rosemary. The sauce should be reduced to 4 dl. It will take some hours. Before serving, remove the sauce from the heat, add cold butter and whisk. The butter will help to get the right consistency, get the sauce shiny and above all, make the taste even better. Put all ingredients for the pesto in the mixer and blend. If it is too thick add more oil. Grill the lamb on high heat a minute on each side. To avoid all nice juices to leak, you have to fry the meat in a really hot pan. Put the lamb in the oven (120⁰ C) for approximately 10 min. The meat temperature should be 57⁰ C. Let the meat rest under aluminium foil for some minutes. This is done to avoid the juice to ooze out. Arrange the terrine and the pesto on one side of the plate. Serve the lamb on a bed of fried red onions and larding bacon. The sauce should be sprinkled around the bed. Enjoy. Heat the oven to 200 ⁰ C. Blend everything together and pour your mixture on to oven-paper in a square oven-proof form. Bake for 20-30 minutes, depending on how muddy you want it. Let cool off for a while and put the cake in the freezer for an hour. Cut your cake in squares; stick them onto a lollipop (or something similar) and dip them in melted 70 % chocolate. Place your dipped mud cake-pops on aluminium foil and let the chocolate set before serving. Shot 1 – mix the juice from the passion fruits with the powdered sugar. Shot 2 – mix the mango juice with finely grated ginger. Shot 3 – mix the raspberries with Tequila. If to sour, add a bit powdered sugar. Strain the shots into snaps glasses. Serve each lolly with a shot.